Jason Scotland’s agent Mike Berry says that the striker will stay if the club offers him an improved contract. Earlier in the week, the club’s top scorer indicated that he’d consider a move away from the Liberty Stadium if a Premiership club were interested. Berry says that Scotland would turn down the chance to play in the Premiership next season if the Swans offered him a new 3 or 4 year contract, to cement his long-term future here. ‘I firmly believe that Swansea have got a jewel in Jason, and it makes sense to me for them to offer him a deal which will keep him at the club for another three or four years. 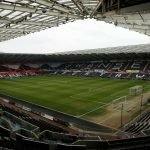 Martinez has said that Swansea City don’t need to sell their players as they don’t need to raise funds and the Spaniard will be doing all he can in the Summer to keep his best players during the pre-season transfer window.